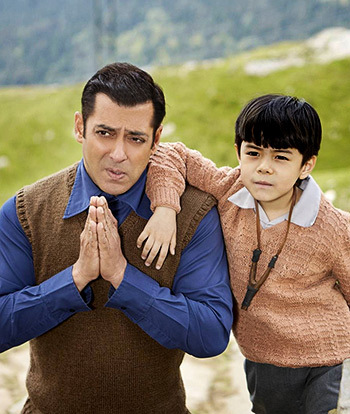 If Tubelight had a real story and wasn't just flip-flopping between monotonous episodes of fluky coincidences treated like divine intervention and cursory battle scenes devoid of danger, urgency or tension, it might have earned some points for heft and affability, feels Sukanya Verma. Salman Khan as a wide-eyed, pure-hearted paragon of virtue alongside a knee-high angel made for some heartrending drama in Kabir Khan's Bajrangi Bhaijaan. The director recreates this imagery to make a case for innocence-prevailing-against-all-odds even more ardently if not half as effectively in his latest offering, Tubelight. While Bajrangi Bhaijaan balanced its marshmallow idealism with sly politics and legitimate humour, Tubelight has an atmosphere of laboured decency. In the absence of offsetting elements, the sweetness feels as synthetic as its smattery illustration of the 1960s. Set in a scenic Kumaon village against the backdrop of the 1962 India-China War, Tubelight ropes in everyone from Mahatma Gandhi to his followers (Om Puri in a kindly, posthumous appearance) to harp about yakeen ki taaqat -- it's not a phrase but a punctuation mark in this movie. In this oddly modified remake of Alejandro Gómez Monteverde's Little Boy, Salman plays a character written for an eight year old by going the man-child way in the tradition of Hrithik Roshan's Koi... Mil Gaya. It worked with Hrithik, but not with Salman. The star tries too hard to act cute bursting in an angry pout or puerile tone when not feigning embarrassment about his perennially unzipped pants aimed to bare his slow-minded condition, exaggerated klutziness and lack of guile. What's worse is how Tubelight manipulates the viewer into warming up to him by contriving scenes of victimisation in the form of an unduly quarrelsome Mohammed Zeeshan Ayyub (stereotype alert). It takes a good deal of suspension of disbelief to accept middle-aged men as naujawans -- and Salman and brother Sohail Khan, playing siblings on screen too, in all their beefy-bodied, puffy-faced, vest and khaki shorts-clad enthusiasm don't really look the part. Though Tubelight, shot by Aseem Mishra in golden light and sparkling hues, wears a freshness that's befitting of its alpine landscape and makes everything it touches -- wool, wood, wrinkles -- look new. The brothers share a close bond and it shows more genuinely than most of the sentiment in the film. When Sohail leaves to join the ongoing war, Salman discovers the potential of his belief with the help of magicians and munchkins. He has a fascinating encounter with a charismatic illusionist (played by Shah Rukh Khan) whose piercing eyes and mysterious smile haven't quite forgotten the pain of being ridiculed for not being like everyone else in My Name is Khan. The duo share stage and exchange inspiration that comes in handy when he meets the adorable kid (Matin Rey Tangu) and his elfin mother (Zhu Zhu). They're all delightful yet with nothing significant to contribute. If Tubelight had a real story and wasn't just flip-flopping between monotonous episodes of fluky coincidences treated like divine intervention and cursory battle scenes devoid of danger, urgency or tension, it might have earned some points for heft and affability. Sohail, despite a brief screen time, is a source of endless frustration. His impending fate drags this already slow movie even more sluggishly to its predictable conclusion. Having said that, it's hard to ever dismiss Kabir Khan in entirety. His sensibility is profound even when distracted by the mawkish facets of storytelling. The erstwhile documentary filmmaker craftily remarks at our tendency to uphold superstition over science as well as the ridiculous expectation from a section of citizens to constantly validate their nationalism as the ongoing debate of growing intolerance rages on till today. Scenes where Salman and Tangu compete over a high decibel of Bharat Mata Ki Jai reveal deep-rooted prejudices. Alas, not enough to be dazzled by the boring, bogus naiveté of Tubelight.